"If the dead can't rest in peace, how on Earth can the living? " There are several real life haunted houses in St. Augustine, Florida. Nestled on the beautiful shores of the Atlantic Coast, St. Augustine has the unique distinction when it comes to historical notations and the socially elite. This Florida city has been referred to as the “Nation’s Oldest City” for quite some time now. As you walk or drive through the city, you are immediately surrounded by a culturally rich history. It is difficult to explore any other location in America that comes close to the ambience that is presented by St. Augustine. Virtually everywhere that you look, you are surrounded by beautiful ancient structures, roads lined with bricks, and many individuals signing up for one of the many ghost tours available in the city. When it comes to haunted places in Florida, St. Augustine is considered to be one of the top ranking cities. In this guide, you will learn about some of the mysteries surrounding the real life haunted houses in this historically rich community. Throughout history and in today’s modern world, rumors abound that a number of restless spirits are present in and around the St. Augustine Lighthouse Museum. These stories actually started circulating in the year of 1853. This is when the first keeper of the lighthouse passed away. His name was John Carrera. The tower that now stands on the property is relatively new and the past keepers of the tower did not fall to their death from the one that currently stands, but the lighthouse that stood before it. In the year of 1859, another keeper by the name of Joseph Andreu passed away as a result of a fall. It was then that the city supported the fact that his wife, Maria Andreu, become the next lighthouse keeper. Just a little while later, a new keeper took up the position. Unfortunately, on the 1st day of April in the year of 1889, the new keeper whose name was William Harn, passed away as a result of developing the serious medical condition known as tuberculosis. Soon, Mrs. Harn took over. It was not long before another man acquired the position. His name was Rantia. It is documented that his wife died at the location in the year of 1894. As time progressed, the need for a new tower became evident. By this time, individuals in the area and those that visited the area had started to share stories of the seemingly paranormal based events occurring in and around the home that sat on the property, as well as the old tower itself. The man who oversaw the construction of the new tower construction was named Hezekiah Pittee. This individual was originally from Maine. He elected to move his family to the house located on the property where the new tower was being constructed. In order to assist with the construction, there was a type of railcar used to transport construction supplies from the ocean to the construction site. The children often played in this car. On the 10th day of July in the year of 1873, five of the kids fell into the water from the car. A young boy and a young girl were saved. Unfortunately, two of Pittee’s daughters drowned that day. It is also documented that a young colored girl died as well. The causes of death on all three were drowning. 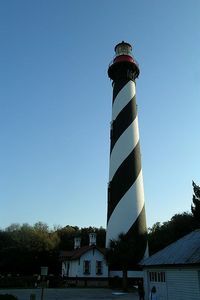 Many individuals claim that the spirits of the past lighthouse keepers are still present. Many have reported seeing and smelling smoke that would be equivalent to that emitted by a cigar. There are stories that small children are seen running and playing around this real life haunted house and lighthouse in St. Augustine, Florida. Many have described seeing a small girl peering out of a window on the top floor of the museum. It is very common for individuals to hear the sounds of footsteps – even when no cause may be identified. Disembodied voices and other strange sounds have been heard in and around the St. Augustine Lighthouse Museum and tower. Is this one of the most haunted places in Florida? Yes, it seems it is. However, this remains to be one of the greatest unsolved mysteries when it comes to the spiritual side of the Sunshine State. If you are interested in real life haunted houses in St. Augustine, Florida, you may be interested in a structure that is collectively identified in the area as “Fay’s House”. The lady that resided at this structure during her life whose name was Fay was known as a bitter woman with a bad attitude and an outspoken nature. She was not very well received as a result of her harsh personality. The neighbors did not particularly care for her or the way that she kept her home. She was not one to spend a lot of time or effort into making sure that her home was maintained. Eventually, the top floor of her home became so run down that she hired help to fix this region of the home. As the hired help attempted to fix the home, she became quite angry and informed him that he had to leave at once. Immediately thereafter, she experienced an accidental trip and fell. Upon falling, she died. Several days later, the mailman reported the fact that a strange odor was coming from the home. Upon investigation, the authorities established that the odor was the smell of Fay’s body decomposing rapidly inside the structure. Naturally, relatives were contacted to come and identify her body and take possession of her property. The relatives immediately witnessed many strange occurrences. Windows and doors would open and close without any outside force and many claimed that they could see Fay standing inside the window upstairs. Today, many people on the ghost tours and many locals still claim that the angry apparition of Fay may be observed from the upstairs window. As you can see, when it comes to haunted places in Florida, St. Augustine is a wonderful location. This culturally and historically rich community consists of many haunted places such as real life haunted houses, haunted cemeteries, haunted schools, haunted churches, and even haunted forts that once stood to protect the city. You may even find the apparition of a young girl moving around the City Gates and waving to those passing by on the street! If you are interested in real life haunted houses in the State of Florida, Fay’s House and the St. Augustine Lighthouse Museum are wonderful places to take ghost pictures or capture some haunted videos!